Action from the City of Peterborough v Cambridge City match, which ended in a 4-4 draw. City of Peterborough men will be looking to build on last weekend’s great fightback when they entertain National League East Conference high-flyers Brighton & Hove at Bretton Gate this Sunday (1.30pm). City trailed 3-0 against Cambridge City at home on Saturday but stunned the visitors with a terrific comeback that earned them a share of the spoils and a welcome point. With two minutes left it was 4-2 to a Cambridge side coached by City of Peterborough’s clubhouse manager, Gareth Andrew, but Joe Finding completed his hat-trick from a short corner and then in the final seconds Ross Ambler was on hand to make it 4-4. Peterborough manager Graham Finding said: “We will take a lot of positives from Saturday’s match. “We showed we have the ability to compete against an established National League side like Cambridge City. We will go up against a very strong Brighton team with the belief that we can do well, a belief that stems from coming back from 3-0 down to secure a draw. “It will be another tough examination for us at home. Brighton are the current joint league leaders and are unbeaten, with three wins and a draw from their opening four games. “They have two of the top marksmen in the league in the shape of Welsh short corner specialist Joe Naughlty and Dutch striker Robert Schenk. Peterborough will name an unchanged side. The City of Peterborough ladies first team were also celebrating on Saturday. Anna Faux struck late to earn them a 1-0 win over St Albans seconds at Bretton Gate and keep City second in the East Premier Division. City are two points behind leaders Chelmsford ahead of a trip to lowly Wapping this Saturday. City of Peterborough Ladies seconds made it five wins out of five by beating Pelicans 3-1 and are four points clear at the top of Division Two North West. Wisbech Ladies were 4-0 winners at St Neots in Division One North through goals by Laura Overland (2), Izzy Pope and Ellie Padmore despite having Hannah Strickle sent off. It was the first time she had ever been carded. 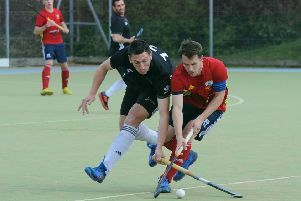 Back to the men and City of Peterborough eighths won 3-2 away at Leadenham thirds in Division Six North West with goals by Matt Browne (2) and Jags Singh to record the only win of the weekend for the City men’s teams. Dan Martell, Jonathan Shippey and Tom Jupp were the marksmen as Wisbech firsts won 3-2 against Potters Bar in Division One. Ace cricketer Gary Freear laid on two of the goals.